66: Christian Hosoi at The Barn? Dennis Kane sets the record straight!! 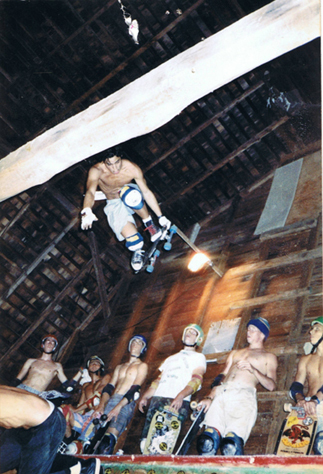 The night Christian Hosoi and Dave Hackett came to the Barn. On the back of this photo it reads “Hosoi and Hackett at the Barn ’85” “7 ft Air”. Over Hackett. I trust this is accurate. On the Deck from L to R is Me (Dennis Kane), a guy from NYC named Pepe (he was Peruvian), Tag(Dan Tag), Ben(Cornish), Murf(Jim), and Rocky Jr(Rocky Vertone). I bet the other Deck was full of the usual boys too. One thing about the Barn was, you never know who will show up. One day I went to work and I missed Chris Miller. Evan Feen (infamous Barfoot Snow Boarder) and Lee “Rats Skates” (OverKill drummer) were regulars. On this day it was Hosoi and Hackett. I think Tom(Groholski) brought them by. I think Steve Olson was with them and he hung around and we took him to the Ditch. NJ State Police showed up and chased us out. Olson looked too shady, I guess. Anyway, imagine looking out the window and seeing this crew. Then in mid session, my mom cames out and yells at them for not wearing head gear. She was the law! Well there you have it true believers straight from the man himself. This was a weekday school night session. I remember talking to Rock and Ben the next day (I was a High School Freshman) and I refused to believe what they told me. I was gutted I missed it. Hackett in the Future Primitive Video… I knew I could find it!! This entry was posted in 1985, Bernie O'Dowd, Christian Hosoi, Dan Tag, Dave Hackett, Dennis Kane, DJ VertOne, four 4, Jim Murphy, Rocky Vertone, SPOTS:, Steve Olsen, TEAM STEAM, The Barn, THE DITCH, Tom Groholski, Who’s on deck? and tagged ART, backyard ramps, Christian Hosoi, Dennis Kane, east coast, jason, Jason oliva, jasonoliva, New Jersey, New York City, Night Session, oliva, paintings, pool Skating, ramp, ride, sk8, sk8t, skate, skate history, skate photography, Skate ramps, skateboarding, skateboarding history, skateboarding photography, skateboards, skatepark, skater, SKATERS, steam, Street Skating, TEAM STEAM, The Barn, The House of Steam, thos, vert, vert ramps, Vert Skating on November 15, 2006 by jasonoliva.